– Bob Dylan – A Hard Rain’s A Gonna Fall. THIS POST HAS ALSO BEEN REBLOGGED ON THE AIMN NETWORK! Occasionally, the odd original thought dribbles its way across the vast empty basketball court that is the author’s mind. “If the government is going to deny benefits to anyone between 18 and 30 who is unemployed and not undertaking an ‘approved’ course of study for six months, then what are they going to do with them all? Since taking office the Abbott government has worked hand over fist to destroy employment rather than create it. From auto-manufacturing and allied industries, to Qantas, Alcoa, Olex Cables, the Shell Oil refinery in Victoria, and a raft of small to medium size businesses, the government has laid waste to the landscape of Australian industry like a drag line operator on speed. Whilst many who are affected by redundancy and job closures don’t all fall into the 30 or under category, those who do account for a significant number. With few chances to ‘earn’ and restricted opportunities to ‘learn’ save for saddling the student with an enormous HECS debt or undertaking an approved Job Network Provider ‘training course’, what happens to the overflow of semi or unskilled labour? This set in motion a train of thought on the implementation of the Green Army ‘work for the dole’ scheme. Of course, the Army! Or at least the Armed Forces. Those between 18 to 30 who are, or become unemployed, face the unpalatable choice of waiting six months while applying for 40 jobs a month under ruthless scrutiny before they are press ganged into the Green Army for the next six months and at the end of which they face another six month wait before they can receive benefits again. 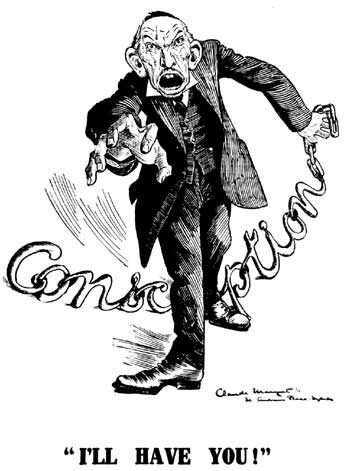 As for Conscription itself, the notion has never sat well with the Australian public from WWI to Vietnam. Arguably, this is why the Abbott government has taken this approach – the LNP don’t want to face the howls of outrage and the electoral backlash which would surely greet an open admittance of the reintroduction of Conscription. Ah, you say to yourself, even if this hypothesis is correct and Abbott is planning to implement conscription by stealth; where’s the money coming from? According to Joe Hockey, we’ve got a budget emergency – discredited – and a ‘welfare emergency’, also discredited. The money would, or will come from the same place that it would come from should Australia go to war. The government would decide on the amount needed, and this is in addition to the current amount allocated to defence, and then somewhere in the bowels of the Treasury, a minion would enter a key stroke followed by a series of noughts and voila! Instant funds. The government would also attempt to recoup much of this amount through the sale of bonds. As it regularly issues bonds to control ‘cash overflows’ in the banking system and keep the interest rate steady, funding through bond sales would present few if any problems. The hypothesis that the Green Army was linked to, or at least part of a plan for Conscription by stealth seemed somewhat fanciful if not totally implausible a week ago and even up until Tuesday. Wednesday morning on Melbourne talk back radio, the subject was – you guessed it, ‘National Service schemes’ which would extend to emergency services such as the Country Fire Authority and the State Emergency Services. In tandem with this notion of ‘National Service’ for the unemployed, quietly, oh so very quietly, the Abbott government has resurrected the Australian Defence Forces ‘Gap Year’ scheme for school leavers. Job opportunities for Rifleman, Driver Transport, Administration Clerk, Supply Coordinator and Unit Quartermaster. The Air Force has Gap Year job opportunities in Airbase Security Roles. After completing basic recruit training and your specific trade training, you’ll be immersed in the Army or Air Force lifestyle while continuing to learn on the job. You’ll learn valuable skills, meet new friends and may even receive recognised qualifications to help progress your future career. Those hoping to travel to exotic places and encounter new people and cultures – and kill them, will be disappointed. Gap Year recruits will not be able to deploy on either national or international operations. Not to worry though, they can always join the regular Armed Forces. The disturbing thing was that most callers were in agreement with such schemes, arguing that they would give the unemployed ‘a sense of purpose and an ideal of team spirit and self esteem’. While this may be all warm and fuzzy as far as sound bytes and slogans are concerned, the author would argue that best sense of self esteem and of purpose comes from full time employment with a living wage and the opportunity to further one’s education should one desire to do so. Nonetheless, it is highly likely that you’re going to hear a lot more about the possibilities of ‘National Service’ in the coming months. ‘National Service’ in either of its guises be it with emergency services or with the military as a Gap Year, reeks of conscription by stealth.